Carcassonne is a true modern board game classic, designed by Klaus-Jürgen Wrede and released in 2000. The game plays two to five players in about an hour, regardless of player count, while you should be able to find a copy for around £20. The game comes with 72 tiles, five meeples per player (this was the first game to use the blend of ‘my’ and ‘people’ – meeple – to describe these person-shaped wooden playing pieces), rules and a score track. That’s it – nice and simple, laying the groundwork for its well deserved ‘gateway game’ credentials. During the game you’ll take it in turns to place tiles on the table to slowly create a map, so you’ll need a decent sized family dining table to play. Sometimes you’ll also place your meeples on the tiles in the hope of completing cities and roads, surrounding monasteries with land or claiming fields – all of which will score you victory points. While the mediaeval theme is pretty bog standard the colourful tiles are very nicely drawn, while also being pleasingly thick and durable. The four-page rulebook is well written and illustrated (with good examples), meaning you should be up and playing in no time. Set up is wonderfully simple; place the starting tile face-up in the middle of the table, stack the rest of the tiles face down in piles around the edge of the table, and away you go (note: some editions of the game come with a free expansion, The River, which slightly changes the start – but not much). Gameplay is equally straightforward; players take a face-down tile from the top of a pile, flip it over, then play it to a legal position on the board. A tile simply needs to attach to at least one other orthogonally – with any sides it attaches to needing to share the same attribute (so town to town, road to road etc). Once you’ve placed a tile, you decide if you want to place a meeple on it. Again, this is simple – if you have a meeple, you may place it on any element of the tile you just placed as long as someone else isn’t already present on that element on an already placed tile (so if you add to a road you can only place your meeple on the road part of the tile if someone else isn’t further down the same road). This doesn’t mean two people can’t be on the same element; it just means you have to be cunning. If a particular city or field is looking lucrative you’ll need to place a tile near to it, place your meeple on it, then place other tiles to join the high scoring element to yours later – although you can be sure whoever is currently there will try to stop it happening. Conversely, placing your tile may complete rather than continue a particular element; a road will end at a crossroads or city gate, while a final piece of wall may finish a city. In this situation, any meeples on the completed element will be returned to their owners and the element is scored. The trick is to always have a meeple in reserve in case of that big scoring opportunity, so you’ll need to recycle your meeples on and off of the board as much as possible – but you can’t take them back when you feel like it, only when they score. This is where the real game lies: both in recycling your own meeples and stranding those of others in impossible to score places. The writer: I find this totally charming each time I play, as it perfectly balances ease of entry with a little strategic depth. It also boasts short yet meaningful turns, plus the chance for player interaction – all the tropes of a successful gateway game. I personally prefer Carcassonne: Hunters and Gatherers, which is practically the same game but with a couple of bells and whistles. But more importantly it’s not expandable, which helps me resist temptation! The thinker: Carcassonne is a little on the light side for me, but it does still hold some appeal for an occasional play. I definitely approve of the slight variant in which players take their next tile immediately after laying their current one, giving them a whole turn to assess where it will work best. But especially with a higher player count there is far too much chaos to really push my gaming buttons. The trasher: Don’t let the cartoony art and simple mechanism fool you – played properly, this is a nasty area majority style game, which can even feel a bit like a war game. To a good aggressive player, turtling (heavily defensive) players are like lambs to the slaughter; let them build their little empire, then get in on all the good bits with clever play. Despite this, its never a game I ask for – but am still happy to play once in a while. 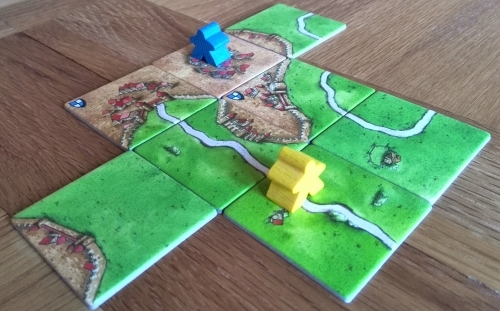 The dabbler: There’s something magical about slowly building up this beautiful visual empire from that one starting tile that makes Carcassonne a joy to play. For me this definitely falls into the ‘experience’ category of board games, where its just nice to sit and chat and watch it evolve – I really don’t mind too much about winning. This can annoy thrashers, who want to feel they’ve vanquished you – not giving them the satisfaction is a win in itself! It’s fair to say that as you add more players to a game of Carcassonne the chaos level ramps up exponentially. If you’re largely playing for fun this isn’t a problem, but if you’re wanting a strategic game experience it goes out of the window beyond perhaps three. There’s an interesting comparison here to the other gateway behemoths, Ticket to Ride and Settlers of Catan. Both arguably play better at three to five players, which may be why some people step away from Carcassonne earlier than the other two. This was certainly my experience, but I do still enjoy an occasional game and it certainly doesn’t preclude it from being a gateway classic all the same – especially at its low price point. Playing ‘pick one, play one’ also leads to some unavoidable rotten luck situations. While this is fair comment, it is easily remedied by using one of the many suggested variants; for example, players have two or three tiles at all times, playing one each turn. While potentially slowing things down a little, this can also add depth for strategic players. Carcassonne was one of my first buys and it enthralled me for months. It was a large part of drawing me back to the hobby, so for that alone it was worth its weight in gold. But if you’re already past the gateway stage, and don’t see yourself trying to encourage others into the hobby, the days of this being a ‘must have’ may be behind you. I got Ticket to Ride around the same time, but the latter has seen more than twice the table time in the five years since. I also rate TtR slightly higher, an 8 to a 7.5, largely because I feel it scales better. If I could only have one of the two games on my shelf, I’d choose the trains over the meeples. But this is in no way a negative review. I’ve still notched around 50 plays, which offers fantastic value for a £20 game – and I’m still always up for it if it gets suggested. Add to this the huge number of small expansions available and you have a game with a lot going for it. 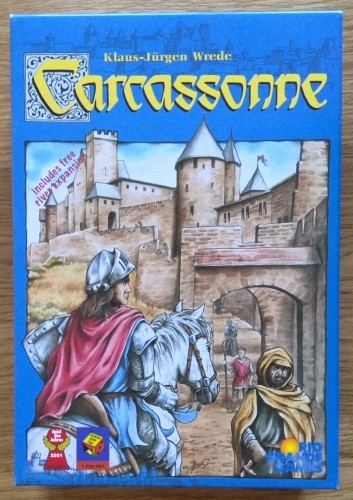 If you are getting back into board games, I’d still put Carcassonne in the top 10 list of ‘must try’ games (now there’s an idea for a blog post…) – its also still just about hanging in the BGG Top 100 list (February 2014) after well over a decade on the market and deserves the massive amount of respect it receives. A true classic.